As luck would have it, we arrived during an inversion event. Cold-pool (e.g. 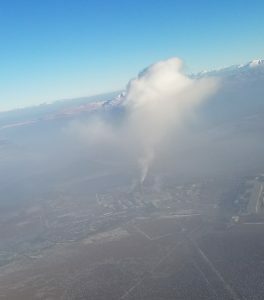 inversion) conditions began in the Utah, Salt Lake, and Cache Valley’s on Saturday (1/14). Without the guarantee of another inversion event occurring before we leave, we wanted to start flying right away. 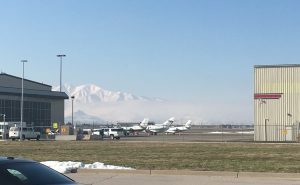 Fortunately, both the Twin Otter and the rental truck with our tools and extra equipment arrived in Salt Lake City on Sunday so we were able to hurry and get ready for our first research flight Monday afternoon. The conditions on Monday looked perfect for an air quality research flight; the weather was calm with haze visible throughout the day. After a mildly stressful pre-flight (a 3 hour period prior to takeoff we use to turn on/warm-up the scientific instruments) where three of the six instruments had issues prepping for flight, we eventually got everything up and running and were only 30 minutes later than our originally planned takeoff time of 2pm. 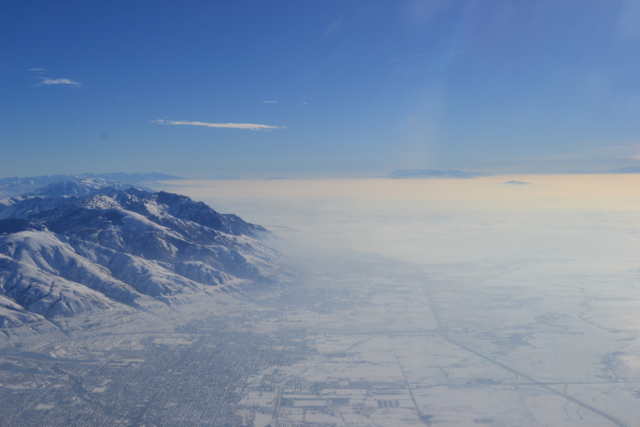 We chose the Northern Loop for our first flight (if you interested in details, see the previous post “Details you Otter Know…”) and by the end we had successfully surveyed the Cache Valley, the Great Salt Lake, and a U.S. Magnesium plant on the southwest side of the lake. About halfway through the flight there was an issue with one of the aerosol instruments but fortunately, that problem was resolved quickly after landing that night. Inversion conditions persisted into Tuesday and we we able to complete 2 more successful flights. We flew our Southern Loop in the afternoon (2 pm take off) over Salt Lake City and down to Utah Valley and the Northern Loop that night (6pm -10pm). 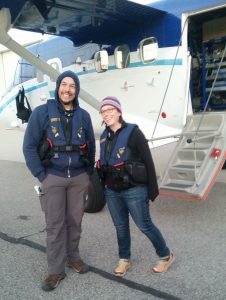 Dorothy and Ale were the scientists on both of these flights and were very excited about the required SwitLiks that are required when flying over open water (no, the Great Salt Lake does not freeze in winter). 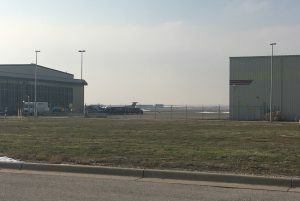 The inversion intensified on Wednesday to a point where the surrounding mountains were not visible from the hangar (see below). Although we are here to study air quality, we were all surprised by the extent of the haze that day. In fact, the 24-hr average of PM 2.5 (particulate matter < 2.5 micrometers in diameter) exceeded the National Ambient Air Quality Standard. Despite incoming fog, we were able to pull off 2 more successful research flights to the North in the afternoon and boxes over Salt Lake City at night. We even made it on the news (story here)! Although the focus of the story was on one of the ground stations in the Cache Valley, we happened to be flying through and did a missed approach that they were able to capture. Also note, we are the National Oceanic and Atmospheric Administration, not Association. A storm system was forecasted for Thursday, which was going to breakdown the inversion event and help to clear the air. Due to the threat of precipitation, we decided not to try to fly on Thursday. On flight days, we scientists can have up to 12-hour days at the hangar and having completed 5 research flights within the first 3 days of arriving in Utah, we were otterly proud of ourselves and ready for a break! Thanks for the posting! Very illustrative of the conditions and descriptive of the successful flights! The Blog is awesome, so informative and really lets us see what is going on and how the researchers are looking at the problem. The photos are great and very reveling!